Photograph showing a typical street scene in 1939 Germany. "Wide World Photo: please watch credit | For main caption please see picture # 904374. 904378 | Somewhere in Germany today. | When a victim resisted them, as the man shown in picture 904377 did, the Storm Troopers, made him get into the cart and another of their suspects push him through the streets as shown in this photo. 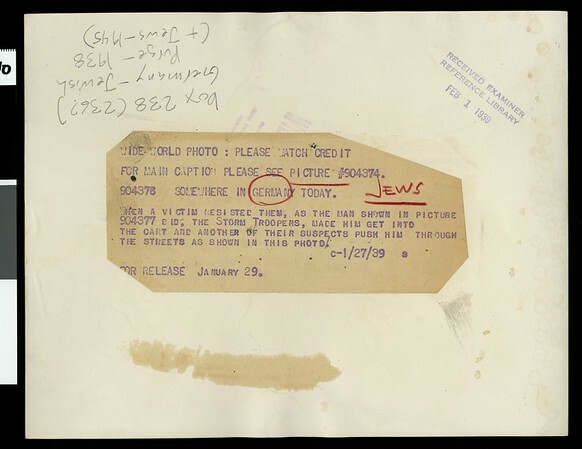 c-1/27/39 | For release January 29." -- typed note attached to verso. "Received. Examiner reference library. Feb 1, 1939" -- stamped on verso.